EOKA (Ethniki Organosis Kyprion Agoniston, in English National Organisation of Cypriot Fighters) was a Greek Cypriot military resistance organisation that fought for self-determination and for union with Greece in the mid- to late- 1950s. Since Cyprus was under British sovereignty at the time, its objective was to attract world public opinion and support to its cause through sabotage against British installations, armed attacks against British troops and popular passive resistance. Britain's Conservative Government had decided to remove its military headquarters from the Suez Base to Cyprus earlier in the 1950s, so there was a strong British military presence on the island. EOKA was, and remains, controversial. While it was popular with the majority of Greek Cypriots at the time and is today considered by many a heroic movement that liberated Cyprus from British rule, there were also many who did not support it. Cyprus's Communist party AKEL was the leading voice against EOKA. Despite agreeing with its aim to establish union with Greece, AKEL opposed EOKA's its violent methods, preferring strikes and demonstrations. It has been claimed that part of EOKA's agenda was to attack the Turkish Cypriots, most of whom did not want to see Cyprus annexed by Greece, and that the EOKA campaign precipitated the deterioration of intercommunal relations. Indeed, during the summer of 1958 the island verged on civil war. Memoirs of EOKA fighters indicate that at times the organisation did target Cypriots, both Greek and Turkish, who supported the British presence. The British colonial government appeared to exercise a policy of "divide and rule", drawing the majority of members of the island's police force from the Turkish Cypriot community. Whether this was a deliberate policy, or the consequence of widespread Greek Cypriot unwillingness to enrol in the force, remains open to debate. As a result, EOKA perceived its actions as attacking the British government, while the Turkish Cypriots often perceived them as an attack directly against the Turkish Cypriot community. The organisation was headed by George Grivas, a Cypriot-born Colonel in the Greek army. Grivas assumed the nom de guerre Digenis ("two-peoples") in honour of the legendary hero Digenis Acritas, who repelled invaders from the Byzantine Empire during the Middle Ages. EOKA was clandestinely supported by the Greek Government in the form of arms, money and propaganda on radio stations aired from Athens. The EOKA campaign began on 1 April 1955. Over 30,000 British troops were assigned to combat the organisation, which officially claimed the life of 104 British military personnel. Many EOKA members were brutally tortured and/or hanged by the British. 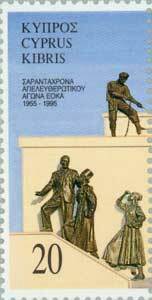 Michalakis (Michael) Karaolis and Andreas Dimitriou, the first Greeks hanged in May 1956 by the British authorities . 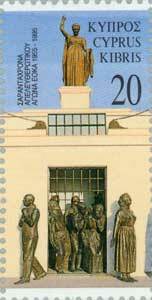 EOKA's activity was officially suspended on March 9, 1959 in response to the signing of the Zurich - London agreements, February 19, 1959, which established an independent republic of Cyprus. 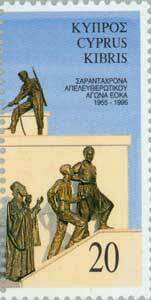 Actual independence was formally declared on 16 August 1960 However, the settlement specifically ruled out enosis - the union with Greece sought by EOKA. This led to a feeling of dissatisfaction from a section of the Greek Cypriot population that shaped the events of the following years. See History of Cyprus. EOKA-B was a Greek Cypriot right-wing pro-enosis paramilitary organisation formed in 1971 that was supported by the ruling Greek junta which came to power in 1967, overthrowing the legitimate Greek government of George Papandreou. When George Grivas returned to Cyprus in 1971 he created EOKA-B in response to President Makarios's apparent failure to deliver on the policy of enosis. He was angered by Makarios's rejection of enosis in 1959, and was further upset when the President reaffirmed this position on re-election in 1968. 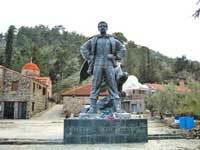 Grivas then took the reins of EOKA-B, planning to overthrow Makarios and achieve enosis through violent means. Whereas EOKA (1955-59) was seen by the majority of Greek Cypriots as an anti-colonialist freedom-fighter group, EOKA-B did not have the same overwhelming support. The Greek Cypriot population were sceptical as a result of EOKA-B's open involvement with the unpopular Greek junta, and after eleven years of independence there had been some cooling of enosist sentiment, brought about partly through Makarios's neutralist leadership of an independent republic. The popularity of EOKA-B fell further after attacks on Greek Cypriot Socialists and supporters of independence, while there was public outrage following the murder of government minister Polycarpos Georgadjis and a botched assassination attempt on Makarios himself. When Grivas died from heart failure in January 1974, the new leadership of EOKA-B increasingly came under the direct control and influence of the military junta in Athens. On 15 July 1974, EOKA-B - with approval of the Greek Dictator Ioannides and the help of the National Guard - launched a military coup, overthrowing Makarios and installing Nikos Sampson as President of Cyprus. This action served only to trigger a Turkish military Invasion on July 20, 1974 which led to the subsequent and continuing Turkish occupation of more than a third of the island's territory.